According to the team at the Pantone Color Institute, which calls itself the “global color authority,” green will be everywhere in 2017. Not just any old green, of course, but the green that evokes images of spring. The yellowy green of new grass and trees budding. “Greenery” is Pantone’s Color of the Year for 2017. 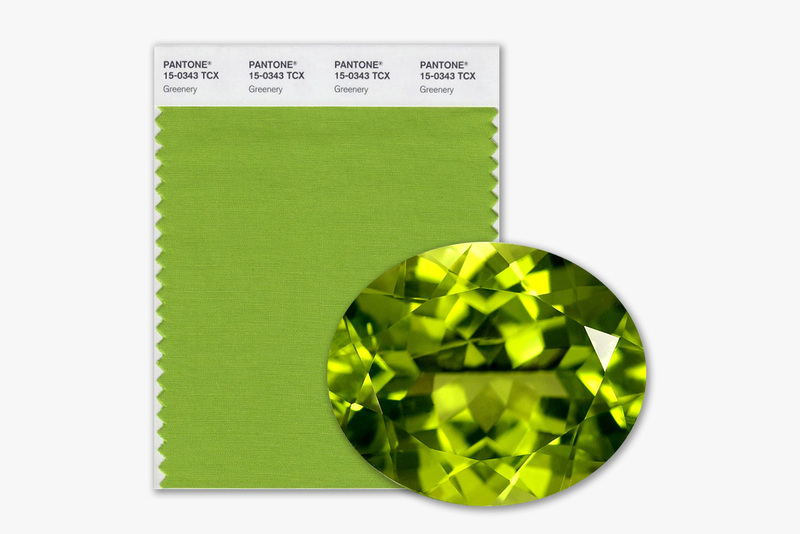 According to Pantone spokesperson, Leatrice Eiseman, “This is the color of hopefulness and of our connection to nature. It speaks to what we call the ‘re’ words: regenerate, refresh, revitalize, renew. Every spring we enter a new cycle and new shoots come from the ground. It is something life affirming to look forward to." Because Pantone's color selections aren't licensed to other companies, Pantone has no way to gauge the effect of their color choices in the marketplace. They are however picked up by designers of clothing, textiles and furnishings as well as, jewelry and accessories and can be seen in use in these arenas. While some may think that green is hard to wear, it has shown up all over the Red Carpet and runways, as well as in clothing and furniture stores. In jewelry it is rare to find a natural green gemstone, such as emerald. However, there are some more affordable alternatives. The closest to the emerald color that comes to mind is chrome diopside. It is a beautiful, rich shade of green and much less expensive than emerald but still a bit hard to come by. Agate is a great alternative and comes in any shade desired because it can be dyed. Turquoise also comes in green shades and is a nice change from the more widely recognized blue tones it comes in. As a designer, I am embracing the Color of the Year and can't seem to get enough of it! So enjoy this Spring and all of the colors that remind you of it. The sunny yellows, bright pinks, vibrant purples and even the toned down pastel shades of these colors. I was ready for the change from the deeper, richer colors of fall and winter and am going with the trend in my new designs.